Youngsters learn best if they stay focused. Addition games for kids are great tool for teaching since they love to play games. So they will be learning addition skills and having fun at the same time! 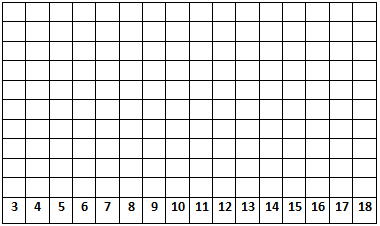 Preparation: Print the dice chart here. Have each player choose a different color pencil or crayon. Have each player roll all three dice. The person with the highest sum goes first. The player who goes first will toss all three dice at the same time. The player will them mentally add the three numbers shown on the dice to get the sum. The player says the sum aloud and the other players will then agree or disagree with the players sum. If their sum is correct, that player will color in any box above their sum at bottom of graph. If the player calls out the wrong sum, they lose their turn for that round. Play then goes to the next player and proceed in the same manner as above. The first player to color in four squares that are touching with their color wins the game. * If you want to reuse the dice graph board, you can use colored tokens instead of colored pencils or crayons. If you go this route you may want to laminate the dice graph so you can use it again for later. * Another fun way to play this game is playing teams. With four players, you can pair the students together for two-person teams. Each team will share the same or pencil to mark the boxes.